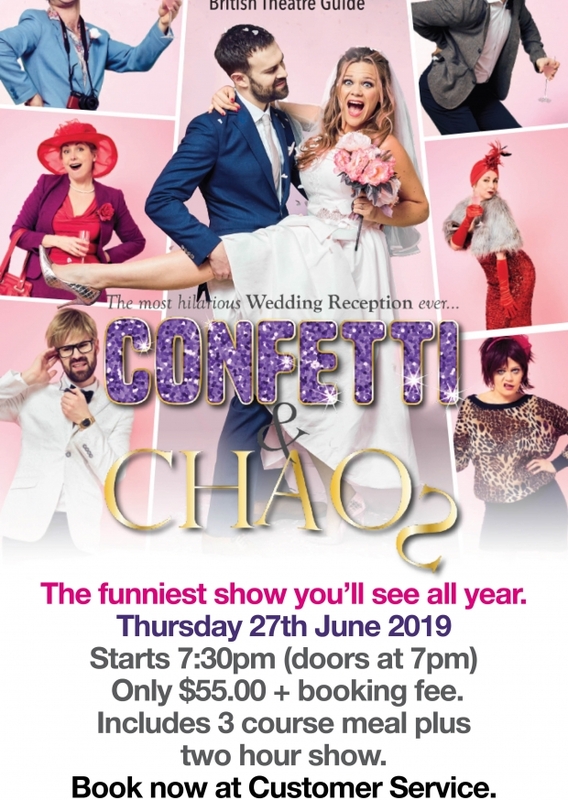 Confetti & Chaos – this is the worst wedding reception you’ll ever go to… and everyone is invited! A 5-star dining experience with fun and mayhem bursting from the seams of a wedding dress. This completely immersive and entirely original comedy pulls out all the stops – including quick-fire character changes and quick-fire laughs. It’s another mad interactive show by the makers of the international hit, Faulty Towers The Dining Experience, and it’s coming your way – appearing in Goulburn in June 2019. From arrival through to seating, eating and dancing, this is a totally immersive and highly improvised comedy dining show. Written and produced by Australia’s Interactive Theatre International, this original piece features four phenomenal actors in multiple madcap roles; the cast for Goulburn Workers Club features two Brits in the male roles fresh from London’s West End, Dan Wood and Otis Waby. Tickets: $55.00 pp (plus booking fee) – all tickets include a two-course meal plus cake for dessert (special diets catered).